The closer the release date of Star Wars is, and the new Battlefront game, the more people ask about Star Wars characters. Coincidence? No. I’ve done the main cast I think, or at least the ones people really care about. But what about Chewie? 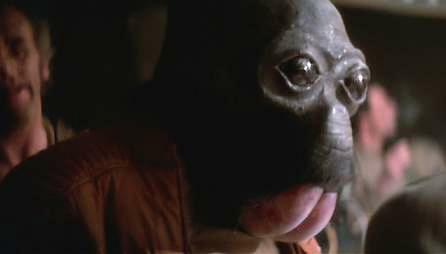 And Ponda Baba? 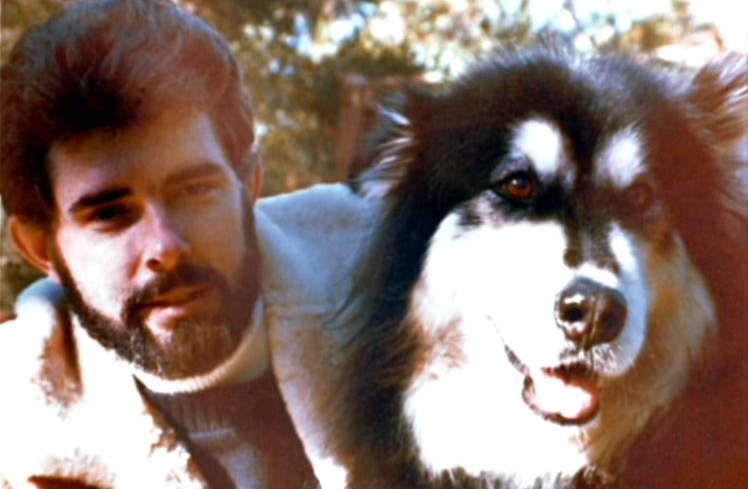 Let’s stick with Chewie. He growls and whatever other noises he makes and that’s it pretty much. So surely we can’t. I mean, a dog can have a personality of sorts but that doesn’t mean he can be typed no matter how many times you’ve “jokingly” done it. But there’s enough to his character that we’ve got to be able to find something there resembling an MBTI type. A 200-year-old Wookie of the planet Kashyyk, Chewbacca’s introduction to Han Solo goes back to Han being an officer in the imperial Navy. When Han refused to kill Chewie, the two ultimately when into smuggling together, with Chewie protecting Han for saving his life. He’s good with machines, he can play whatever Star Wars chess is called, and he displays specific feelings toward his inner circle. Not to mention he fires a bowcaster, aka a crossbow that shoots lasers. That doesn’t quite speak to type as much as it does give way to the idea that there’s more to Chewbacca than there is a dog, even if Lucas created him with his own dog in mind, who used to sit in the passenger seat wherever Lucas went. Not unlike our friendly neighborhood smugglers in a galaxy far, far away. 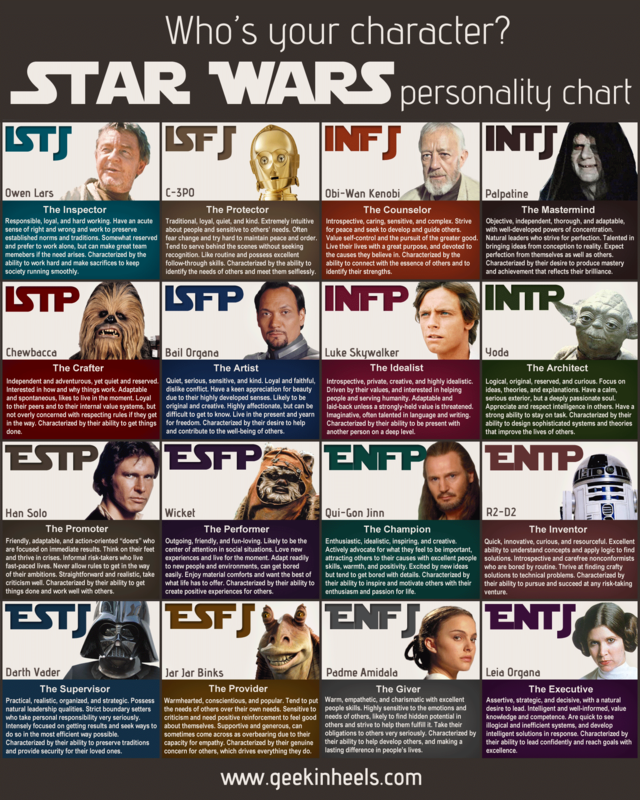 Often times I’ve seen Chewie labeled as ISFP, which seems fair enough if you’re only going by the letters. Quiet (Almost without a choice since we can’t understand him anyway) and seemingly laid back, the functions can make sense to a point as well. ISFP would fit mostly due to the ISFP’s auxiliary Se (Extroverted Sensing) function that makes them hands on, in the moment. Chewie’s presumed dominant Fi would keep him to himself while his Se would have him taking in the moment. Fi alone doesn’t keep one to themselves but dominant Fi and auxiliary Se have proved to have that affect. While ISFPs can be friendly enough, they don’t mind a good bit of solitude. This would be the case for most Introverts you would think and that’s generally the case, but everybody uses time to themselves differently and strong Se users have to space out completely or dive into something head first without rest. Chewie’s mechanical tinkering could speak to that. And while we only have other character reactions to go off of, Chewie seems to come off pretty defensively as Fi can do. Though we’re only hearing growls and yelps, Luke and his homies seem to be pretty aware of what he’s saying and it’s often cautionary or seemingly annoyed. Fi doesn’t mean “stick in the mud” but when something crosses and Fi user’s line, they’ll speak up about it. It’s really the only way to get on the ISFP bad side since they’ll usually be pretty go-with-the-flow. Or at least appear to be. 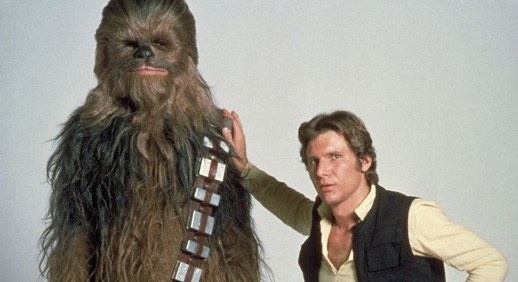 I bet Chewie hates when Han just uses him like a wall. But on the other side of this, we’ve got ISFJ. Though the two types aren’t really much alike, they’ve got some traits that could us confuse one for the other, all superficial. Chewbacca’s possible Fi could just as soon be Si (Introverted Sensing) being unaccepting to the idea of anything they’re not familiar with. Even though an ISFJ’s auxiliary Fe (Extroverted Feeling) will often have the user going with the mood of the group to keep things even, ISFJs are known to speak up at times when they feel very strongly about something and they don’t mince words when it happens. As for Chewie’s mechanic skills, ISFJs themselves are pretty handy in their own chosen hobbies/trades and can spend long hours to themselves (Oh those introverts) working on practical skills that range from basic chores, carpentry, and just about anything else that can take long hours around the house. But keeping a practical project going is key for them to feel accomplished in life. But the thing that really sticks out is Chewie’s commitment to Han. Sure, anybody would hang out with him. He’s awesome. But Chewie’s lifelong debt to him, though it could be begrudgingly, really seems to speak more to the ISFJ role they prefer to take in public scenarios. A co-pilot, friend, protector. Sounds like Colossus as a dog instead of a metal man. But really, the SJ types seems the most interchangeable in terms of interests, so going by what a character does isn’t very helpful, again, if Chewie can be typed at all. Heavy Se users look for a rush of some sort and Intuitive types look for whatever will spark their imagination, but heavy Si users will do whatever’s been their norm for a long period of time. Anything the Si-user becomes accustomed to is their life and to do things any other way is difficult for them to adjust. How does this relate to Chewbacca? Aside from him being distrustful of strangers (As stated in the Wookiepdia and seen in the films), his entire race is also naturally gifted in advanced robotics. We see Chewie put C-3PO back together, work on the Falcon regularly, fly ships he apparently hasn’t had any training in. It’s always a stretch comparing the infinitely impressive skills of fictional characters to real people but ISFJs can still be compared. Whatever the ISFJs skills are put into practice in an area they’re even somewhat familiar with, you’ll get steady results. Working on this car’s engine isn’t that difficult since they’ve worked on that car’s engine, etc. Also, they’ve make a great 70s tribute band. 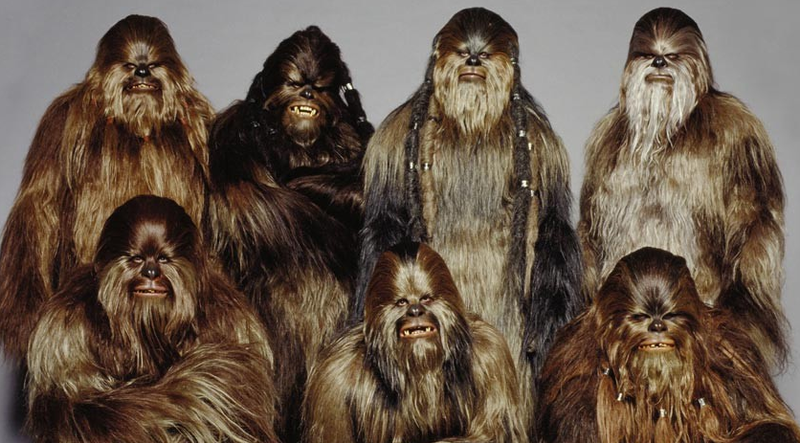 And being that most of Chewbacca’s traits can be traced to how Wookies just are, it really does seem like he simply follows in the tradition of his people. Never thought I would type a sentence like that without laughing. What has my life become? Still, ISFJs are always heralded as the “keepers of tradition” and other titles none of them really like. This doesn’t mean all of them will always don the same nasty Christmas sweater Big Daddy Smithers would wear every year but that they keep to what’s become normal to them. Being that Wookies are supposedly highly moral, courageous, loyal, and just about every other trait humans should encompass, ISFJ fits Chebacca better. Aside from being all those things, he’s keeping in line with the standards of his race rather than casually going against the grain or go-with-the flow, as the ISFP goes back and forth between. As for the idea of Chewie being an ISTP, I can’t get behind that. He’s shown to be the “teddy bear” type of character, or a Great Dane of sorts- physically untouchable but still whines or has his “big baby” moments. ISTPs can act like big babies sure, but not in moments of excitement. An ISTP Wookie would probably come off as more of a jerk whether they meant to or not. 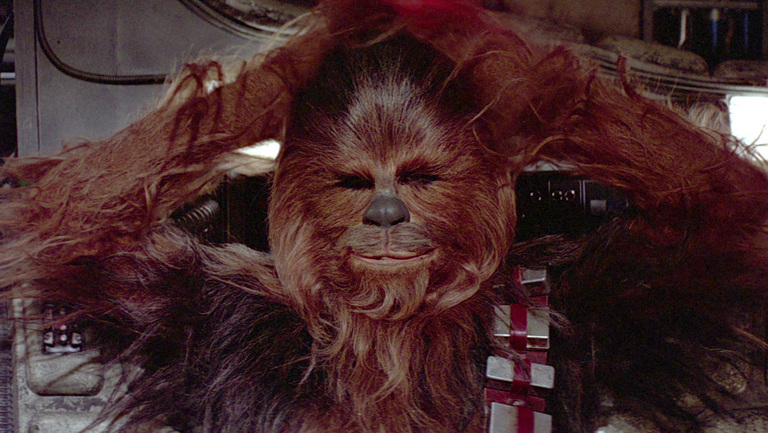 Given how they speak, the audience needed to see a more animated character and we get that in Chewie. I doubt we would have seen his emotions as much if he were ISTP. This entry was posted on 08/11/2015 at 12:42 pm and is filed under MBTI Artisans, MBTI Guardians, MBTI Stuff, MBTI Whatever with tags Chewbacca, isfj, isfp, istp, mbti in fiction, star wars. You can follow any responses to this entry through the RSS 2.0 feed. You can leave a response, or trackback from your own site. I’m glad you are back with your posts again! Thanks man, just needed to try something different. Dayyymn! Post flood! Love it! Glad to see you back! I’m still trying to grasp a few things about the types here. I’ve read a bit about the way the functions actually sit on the axis. Dom_Inf[are one axis] & Aux_Tert[are the other]. Would it be valid to consider that for Chewie (or Wookies in general) that: The auxiliary Fe implies the tertiary Ti which contributes to their reliable nature in the way of technical tasks? It seems to be any type’s Lead function that really gives them a “signature” to their presence. As far as I can tell: For extroverts, the aux & tertiary each accent the dominant function independently. While for introverts, the tertiary and aux oscillate together which then compliments the dominant function. Is that close? Way off? I don’t think I could have ever worded it that way, but that sounds about right. The dominant drives you, the auxiliary steers you, the tertiary underlies them, and the inferior keeps you grounded in what that function does. There’s probably a better way to say that, but there it is all the same.